Paul Weller Will Join The Who For June 2015 Concert At Hyde Park! – Paul Weller News! 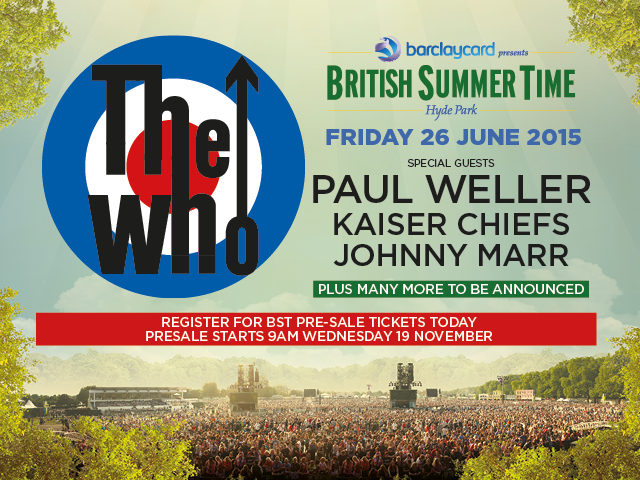 Paul Weller Will Join The Who For June 2015 Concert At Hyde Park! 2 Comments on Paul Weller Will Join The Who For June 2015 Concert At Hyde Park! Paul Weller has been announced as a special guest for The Who’s massive Hyde Park concert in London as part of their 50th anniversary tour. The concert will take place on Friday 26 June 2015. You can register for a special pre-sale that starts this Wednesday at 9am 19 November HERE! General sale begins on Thursday! When is he coming to Spain or Portugal? I live in Spain, but I,m next to Portugal, in the northwest of Spain. is he coming to Porto,Portugal ? Previous Entry Setting Sons Super Deluxe Edition Out Monday, 17 Nov! Next Entry Paul Weller Interviewed By Shaun Keaveny On BBC 6 Music Today!